Hi friends! I hope you're having a lovely day! Still no news over here. Keep your fingers crossed that answers about my health will come soon. Also, THANK YOU to everyone who has been leaving such kind comments about my health and sending good thoughts/prayers for me. I really appreciate it! Today, I have a card for you using the new March release from My Thoughts Exactly. It's a set called Easter Greetings and it's SOOOOO fun! I LOVE all the "Peeps" sentiments! Eeek! When, I'm feeling better I think I'll make a layout with this set! YAY! But for now, a card. For my card, I used Card Positioning Systems sketch #255. The paper is from Echo Park Dots and Stripes. The sticker is old and from my stash but I thought it went SOOO cute with this sentiment! I added Green Apple Divine Twine, used an EK Success border punch, and added some Recollections bling to finish this off. Be sure to check out the My Thoughts Exactly Blog to see all the creations from the other girls today! Or just go visit Jennifer or Lenae directly. There is some serious talent over there! Have a wonderful day, friends! keeping my fingers crossed for you here. 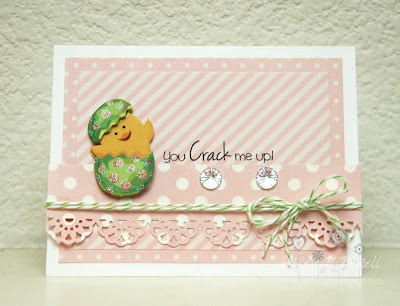 Love your card and that little chick coming out the egg is just too cute! Super cute card Ashley...love that little chick! I hope you feel better soon. I know how frustrating it can be to see doctor after doctor without getting an answer or medicine that helps you feel better. And it's especially difficult when you have two little ones to keep up with too. Praying that whatever is going on will be correctly diagnosed or disappear so that you can get a break from feeling yucky! Too cute!! Just love the chick with the sentiment!! Hope you feel better soon. Thinking of you! oh, wishing you the best...good luck!! love this little chick!! very fun card! Such a cute lil chickie...hope you'll join me this week at 52 Card Pickup! What an adorable little card! So sorry you are still feeling terrible, and I know you're hoping it isn't something serious. Keeping you in my thoughts.